The end of the world is a common theme in books, films, and TV. Zombie outbreaks. Alien invasions. Meteor strikes. Virus epidemics. Nuclear war. 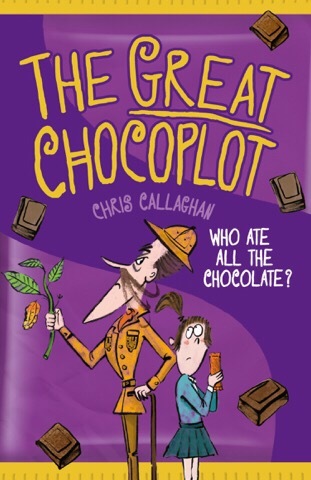 But in The Great Chocoplot, Chris Callaghan has come up with the most chilling apocalypse yet: the end of chocolate. Jelly (real name Jennifer, but if your name’s Jennifer Wellington you’re going to be called Jelly Welly whether you like it or not) lives with her hard-working night-shift Mum, recently-redundant Dad, and slightly potty Gran in the town of Chompton-on-de-Lyte. The town is renowned for its chocolate – in fact, there are dozens of chocolate shops and the largest chocolate warehouse on the planet. All the inhabitants are chocolate potty, too. So when the news comes of a prophecy that all the chocolate in the world will run out, no-one’s really that bothered. There’s plenty of chocolate in Chompton. More than enough for everyone. But soon the chocolate starts to run out. The Chocopocalypse is really happening. Jelly, having an enquiring nature that she probably inherited from her former-scientist Gran, investigates. Does the sinister Garibaldi Chocolati have anything to do with it? What’s Dodgy Dave up to? Why is noisy next-door neighbour Mrs Bunstable sneaking around? It’s up to Jelly (and her Gran) to get to the bottom of the mystery – before it’s too late. Because a world without chocolate just doesn’t bear thinking about. The Great Chocoplot is a fun adventure with a brilliant concept – and like the best apocalyptic fiction, it’s based on reality. There really are risks to cacao plants that could endanger the world’s supply of chocolate – I don’t want to alarm you, but mealybugs spread by ants can devastate whole crops. I loved the way Jelly and her Gran carried out their investigation in a scientific way, too – while still managing to get in jokes about Gran’s big knickers. Jelly is a great heroine, clever and tenacious, with a good sense of the ridiculous. The rest of her family provide a good supporting cast, and it’s nice to see a children’s book that doesn’t push the family into the background for the sake of the drama – some of the most humorous scenes are the touching family moments over a shared bit of chocolate. The illustrations, by Lalalimola, fit the book perfectly – from Jelly’s worried expressions to Garibaldi Chocolati’s sinister moustache, they provide a real sense of fun. The squares of chocolate scattered throughout the pages remind us just what’s at stake, and the purple cover isn’t a million shades away from the Pantone 2685C used by a famous Birmingham chocolate company. Thanks John for the review. I am always looking for books to give friend’s children so it is great to get your thoughts. It would be great to have the ideal reading age in order to ensure I buy age appropriately. Anything from 8 to 12, I’d say. Mild peril, so nothing to terrify younger kids (unless the thought of all the chocolate disappearing is particularly scary to you) but enough humour to keep older kids interested.